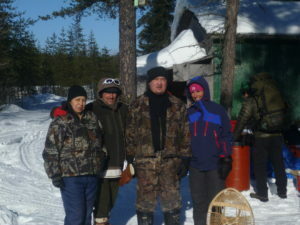 In the midst of the punishing Canadian winter, Bert Poffé and Kiki Nárdiz set out on an adventure through Atikamekw territory in Québec, together with members of the 3 Atikamekw Nations, traveling through Northern bush country amongst the Obedjiwan, Wemotaci and Manawan communities. 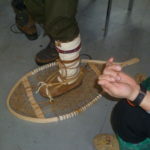 They wore traditional moccasins and babiche snowshoes, and slept in heated winter wall tents and family hunting camps, used over generations by First Nations and Voyageurs. It had been the dream of Bert & Kiki to return to this magical land since traveling several times to Atikamekw Gerald and Carl Ottawa’s bush camp between June 1999 and March 2001. 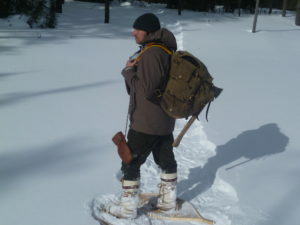 There, they learned many traditional skills and bushcraft techniques essential for both winter and summer survival. For the next 13 years they kept in touch with the Manawan and by the time 2013 came around it was felt a trip to fulfill their dream was long overdue. 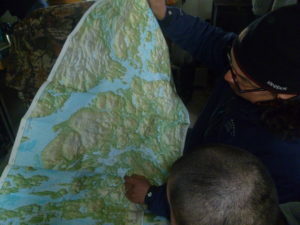 Plans for another adventure in their beloved Atikamekw area were underway. 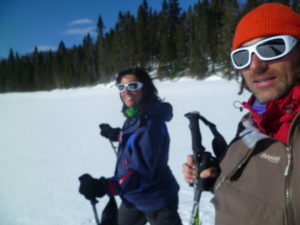 After more than 6 months of preparation and training for the adventure, Bert and Kiki finally landed in Montreal on Saturday, February 1st, where the temperatures were a balmy -6c. 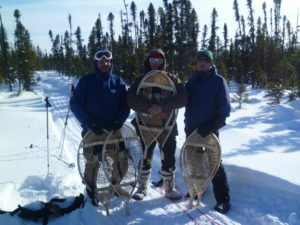 Pascal Ottawa, coordinator of Tourisme Manawan and the snowshoe expedition met them from the airport and they headed 300 km north of Montreal, straight to the Manawan community. Sunday was all about preparing and testing gear and drinking coffee, talking about what would come. On Monday the group – consisting of Carl Ottawa, Debby Flamand and others from Manawan – left together on a 10 hour journey through forest roads, stopping for an obligatory poutine in the Wild West village of Parent, and eventually arriving 300km further north. It was close to midnight when the expedition team finally arrived at Obedjwan. Although the expedition was not unsupported as intended everything turned out well. The Atikamekw Nation wanted to treat Bert and Kiki very well. ‘Roadrunners’ headed out in front of the walkers and scouted out camping spots for the evening. Where possible the roadrunners erected the wall-tent, or prepared the hunter’s cabin with a very welcoming fire to make the travelers feel more comfortable after walking between 18 and 26 km per day. 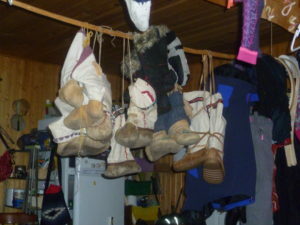 After 8 days traveling on ice and snow the expedition team arrived at Wemotaci, where they had a one day lay-over for resupply. During the first part of the walk youngsters from both Manawan and Wemotaci were inspired and asked to be part of the second leg, walking the remaining 100 km to Manawan with the expedition team. The team was of course delighted to walk together with 11 walkers (amongst them Debby Flamand, wife of Carl Ottawa) on the Atikamekw land. The dynamics were completely different: travel was slower, more organization and coordination was required, but the result was that it all became even more authentic, traveling like a real clan. The temperatures became less extreme towards the end, and the weather was almost always very sunny. 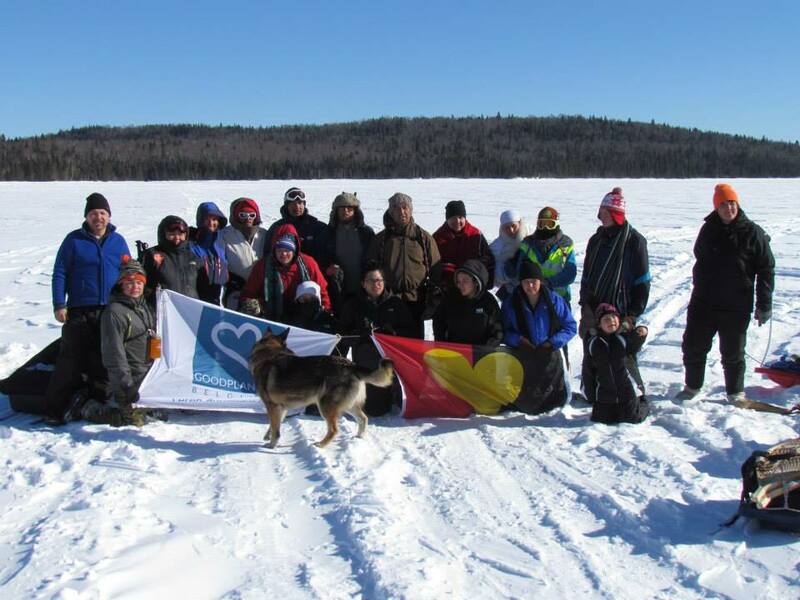 After 5 days The Atikamekw Snowshoe Expedition 2014 walkers arrived at Manawan where the whole village turned out to welcome them with cheer and happiness. That evening, they eat a traditional dinner at the local school, and were given goose bumps at the concert of the Black Bears Pow Wow singers. The days after this unforgettable adventure were spent in Manawan, where Bert and Kiki were invited for breakfast, dinner and supper by many families, and where they also had the opportunity to talk to the children of the local school. After a full 3 weeks living and travelling with the Atikamekw Nation, they returned to Europe with a little bit of Atikamekw in their DNA and hope to return as soon as possible. The Atikamekw are the indigenous inhabitants of the area referred to as Nitaskinan (“Our Land”), in the upper Saint-Maurice River valley of Quebec (about 300 kilometres (190 miles) north of Montreal), Canada.The population currently stands at around 4500. One of the main communities is Manawan, about 160 kilometres (100 miles) north east of Montreal. They have a tradition of agriculture as well as fishing, hunting and gathering. They have close traditional ties with the Innu people, who were their historical allies against the Inuit.